IF anyone deserves to put their feet up, it’s York’s Andy McCormick. The coach of York FA under-15s schoolboys footballers is currently resting after an astonishing feat of running 12 marathons in the 12 months of 2012. 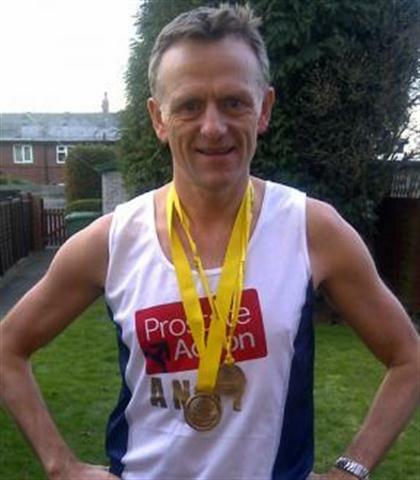 Marathon man McCormick, who who completed his final haul of 2012 in Liverpool on New Year’s Eve, was running for Prostate Action to raise support for research into prostate cancer. His father died from the condition 18 months ago. In addition to his Scouse hours, the Osbaldwick-based coach completed marathons in Gloucester, Cambridge, Suffolk, Edinburgh, Keswick, Stevenage, Barnsley, Howarth, Mablethorpe, Newcastle and Rutland. He is now setting his sights on the Yorkshire Marathon in October. If anyone wants to back McCormick they should visit his www.justgiving.com/Andy-McCormick page on the Just Giving website.